The Electric Dream Team is pleased to welcome to our family of customers the fine people at Virtuoso Performance of Hayward, California. 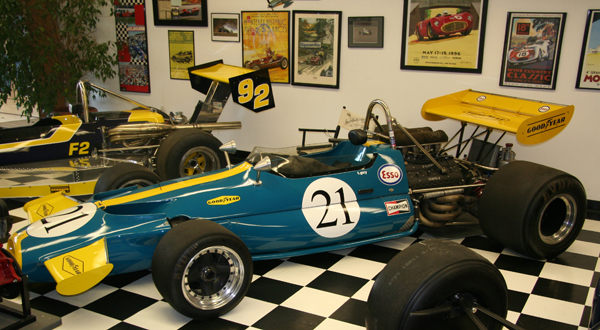 VP is a racing prep shop specializing in vintage racing cars. For this year’s Monterey historic races, where they will supporting 18 of their customers’ cars, VP wanted to have some special entertainment for their customers and friends and decided that a slot car track would be just the thing. The ED tech department was able to design and spec a 4-lane miniature Laguna Seca in Scalextric Sport track. Just this week a member of the Electric Dream Team spent a day at the VP shop assembling and checking out the track prior to its shipment to Laguna Seca. While he was there he photographed an array of outstanding vintage race cars. In an upcoming edition of Electric Dreams News we will have an extensive article on Virtuoso Performance and its slot car track along with photos of some truly mouth-watering vintage cars. In the meantime, here is a little sampling of what you will see. This is the VP layout. For now it’s just set on a flat table painted in a sand color to approximate the real track’s surroundings, but this is just the beginning. We’ll be telling you more as time goes on. This is a very pretty little Ginetta sports-racer. It looks like a lot of fun to drive. Here’s a Brabham BT33 F1 car. It’s on display in VP’s “show room” located in the entrance to the office area, which holds 3 cars, several engines on stands, a showcase of diecast models, walls covered with posters and photos, and some beautiful airplane models hanging from the ceiling. Watch for more on Virtuoso Performance in coming newsletters. Meanwhile, if you would like to know more about VP, visit their web site at www.vprace.com. and see their customers’ cars in action at the Monterey Motorsports Reunion later this month.